One of the hardest things to do as an investor is go against the grain. Being a contrarian by investing in stocks that no one else wants to touch with a ten-foot pole is difficult, especially in markets like this. But most good value investors, including Warren Buffett, David Dreman, John Neff and others use strategies to uncover value where no one else wants to look. The Dreman strategy, in particular, has a deep bias for unloved, out-of-favor stocks. To identify those types of companies, the approach uses four price-focused variables: Price-Earnings Ratio, Price-Cash Flow Ratio, Price-Book Ratio and Price-Dividend Ratio. For a stock to even be considered by my Dreman strategy, it needs to meet at least two of these valuation tests (in addition to a host of other criteria). Dreman conducted studies from 1970 to 1996 that showed stocks with P/D ratios in the bottom 20 percent of the market had an average annual return of 16.1 percent versus 14.9 percent for the market. Dreman was cautious about investing on the basis of this criterion, as it is mainly for income-seeking investors, who are better off investing in stocks that pass this criterion rather than investing in bonds. For investors with different objectives, this is a very useful criterion that should be used in conjunction with Dreman’s other criteria. We use it in our model in conjunction with the three other contrarian indicators. 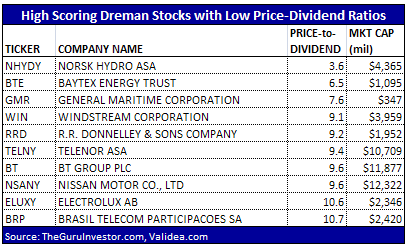 Below, I have listed a few stocks that currently score highly using my overall Dreman approach and also have particularly low Price-Dividend Ratios. *all of these stocks have a Price-Dividend ratio in the bottom 20% of the market (below 11.3) at the current time.